The public space closures have been extended to new towns across the midwest. 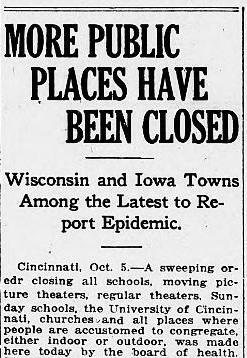 In Cincinnati, OH 4000 cases of influenza lead to the closure of all schools, moving picture houses and churches. Racine, WI and Oshkosh, WI are subject to same closures have been made and the strict enforcement of a spitting ban. The appeal for more nurses is widespread. Source: “More Public Space Have Been Closed,” Grand Forks Herald, October 5, 1918, Page 1, Column 6.